Hi Jeff: I’m interested in hearing more about homoprophylaxis. 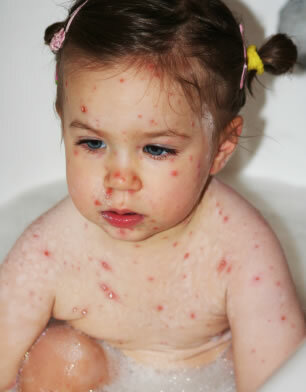 Would it prevent chicken pox, for example, or would it help a child who does naturally contract chicken pox to have a “less severe” form of it? My son isn’t vaccinated for chicken pox, but we’re worried about him potentially getting it (even though he should get it when he is a child) because he already has a lot of rashes and is immuno-compromised (although getting stronger with Heilkunst treatment). Thanks! The short answer is “yes”, and to expand out into a little more detail, a few basic concepts need to be laid out clearly. The first question, if you really think about it, is “how could homeopathic immunization work?” — I mean, after all, the usual application of the law of similars works by applying a potentized medicinal agent (the remedy) to a similar disease state which is already present in the patient, and thus, the remedy destroys the similar disease (“like cures like”). In the case of immunization, however, the remedy is applied before the patient has contracted the disease, so the mechanism cannot be quite the same. To begin to get a sense of what is going on in the latter case, we need to go back to the basic difference between the general immune system, and our specific immunity. Normally, we increase the function of our general immune system through our lifestyle choices of food and exercise, as well as general strategies for dealing with our stress. The total healthcare approach of Heilkunst, as well, works to improve the general immune system, as each treatment effectively frees up the general immune system to function better. What about the specific immunity, though? This is the big promise of the modern vaccination program, and surely a homeopathic immunizing agent should achieve the same, no? To make a long story short, I’ll say that each specific immunizing agent improves both the general and the specific immunity. The general immune system is improved every time that a potentized agent (so-called “homeopathic remedy”) is applied, as illustrated by Dr. Hahnemann in his principles of provings (ie taking a remedy in the absence of having a similar disease). But more to our point here, if you have a susceptibility for a given infection, then you will have a more distinct and strong response to a potentized agent which is very similar to that disease agent. In this process, you will discharge your susceptibility, and therefore be very unlikely to contract the disease if you later encounter it in the wild. This is how specific immunity is attained. If you didn’t have a susceptibility to that disease in the first place, than you won’t have any response in terms of specific immunity, which is OK, because you’re not susceptible to the disease anyways. So, particularly for all of the primary childhood infections, including chicken pox in your example, “yes”, we can very safely and effectively immunize for it with the appropriate remedy. Furthermore, if the child has already contracted the disease, then the remedy will both mitigate the negative consequences of it, as well as generally speed up the healing process from it. In this case, we may often need to make use of one or more ‘pathic’ remedies, to deal with any of the specific symptoms that have emerged, but regardless, the underlying ‘tonic’ remedy (or the potentized disease agent, itself), will always serve the purpose of both the best preventive, as well as best curative remedy for the infection in question. Where your son already has a susceptibility and predisposition, this will help to lessen it, along with the other general treatment approach of Heilkunst.